Generic drug makers are knocking on a door that never has been opened. With a strong undercurrent brewing on several fronts, a geopolitical storm could be raging just on the other side. At the center of the storm: the scientific and economic debate over generic biologics. And while it may be years before the biotech revolution yields its first harvest of generic biologics in the U.S. market, manufacturers already are working to create a scientific and regulatory framework for just such an event. In 2003, the U.S. Food and Drug Administration's Center for Biologics Evaluation and Research approved 22 biological license applications, one more than in 2002 and six more than in 2001. Priority approvals included FluMist, the first nasally administered influenza vaccine marketed in the United States. Other approvals included the first biotech products for psoriasis, asthma, Alzheimer's, HIV/AIDS and multiple myeloma. Analysts are forecasting a strong performance in the sector again in 2004. "As the economy continues in a positive direction and the industry is firmly on its feet, we'll see a very strong performance from biotech in the year to come," said G. Steven Burrill, chief executive officer of Burrill & Co., a San Francisco-based life sciences merchant bank. While down considerably from a market capitalization of nearly $500 billion at the height of the genomics bubble in spring 2000, the biotech industry was still flush with $330 billion in total market capitalization at the end of November, up 32 percent from the start of 2003. And, according to Sherri Cohmer at Anthem Prescription, more than 330 biotech drugs currently are in late-stage research. The hurdle for the generic industry, however, is that there currently is no regulatory pathway in place to bring generic biologics to market. 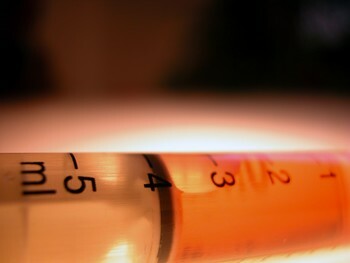 "There is no way to get a generic biologic on the market at this point in the United States," said research analyst David Buck of the Buckingham Research Group. Last year, the Center for Drug Evaluation and Research and CBER approved 466 new and generic drugs and biological products combined. CDER alone approved 362 generic drugs. The Hatch-Waxman Act, which created the framework for more timely entry of generics into the marketplace more than 20 years ago, pertains to drugs approved by CDER. With the exception of insulin and human growth hormone, which could face generic competition within the next 12 months, the majority of biologics are approved by CBER. "We do not believe the technology is there now to approve generic biologics," said Jeff Trewhitt, spokesman for the Pharmaceutical Research and Manufacturers of America. "One thing to take into account is that with these new cutting-edge biotech and genetically engineered drugs, there is no precedent here. It's not like copying a traditional chemical compound. "We're making a transition from something we know well to something we're still learning how to use therapeutically. These are complex new medicines. We've just begun to scratch the surface of the iceberg," Trewhitt told Drug Store News. The industry ran into the same arguments in the early 1980s when generics first were being introduced to market, said Bill Fletcher, president and chief executive officer of Teva North America. Teva, which last month purchased generic drug maker Sicor, has an agreement with Savient Pharmaceuticals to manufacture a generic form of human growth hormone and two other unidentified products, said Fletcher, who added that Sicor's biotech arm is looking at manufacturing the drugs on a global basis. Fletcher said there are various schools of thought on how to prove a generic biologic is equivalent to a branded biologic. "Everyone has ideas, but there are no regulations or codification of those ideas," he said. "From our point of view, good science will always be able to prove equivalency. Consumers deserve competition in that marketplace." It also is likely generic drug makers will be required to conduct clinical trials to show therapeutic equivalence. Buck told Drug Store News that generic biologics will not hit the U.S. market until approximately 2008 to 2010, but there is the potential that the European Medicinal Evaluation Authority may have an approval pathway for generic biologics in place as soon as the end of this year. Generic drug makers to look out for in biologics include Sicor/Teva, Savient and Barr Laboratories, said Buck. Some of the biotech heavy hitters that could face the first round of generic competition include Amgen, Biogen Idec, Eli Lilly, Genentech and Pfizer.